During the 2015/2016 financial year, we celebrated our 45th year as a “Special Work” of the St Vincent de Paul Society. Tastex celebrated the occasion with a wonderful evening which included a cocktail reception at Government House followed by a formal dinner at the Old Woolstore in Hobart. 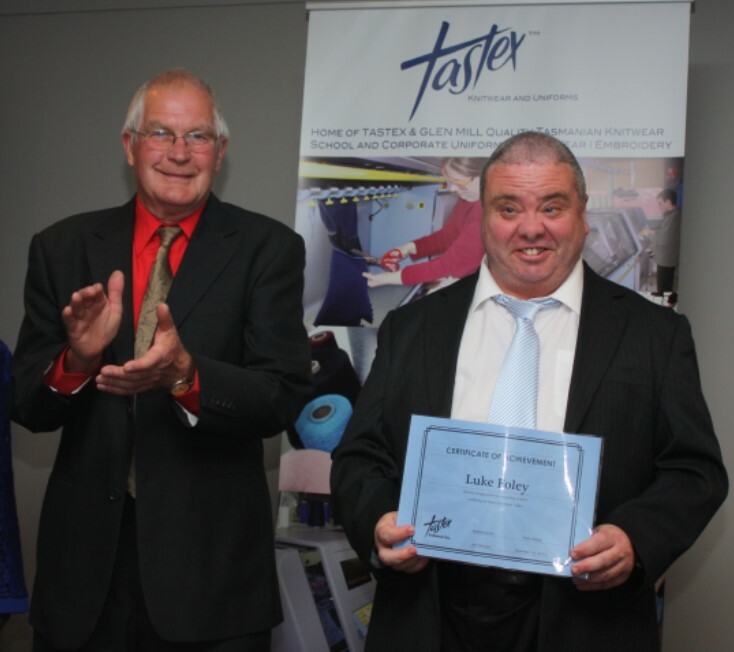 This year Tastex was fortunate to install a new 6 head embroidery machine which was funded by The Tasmanian Community Fund. This exciting project has enabled us to speed up production of our Envirowoolly range of native animals. 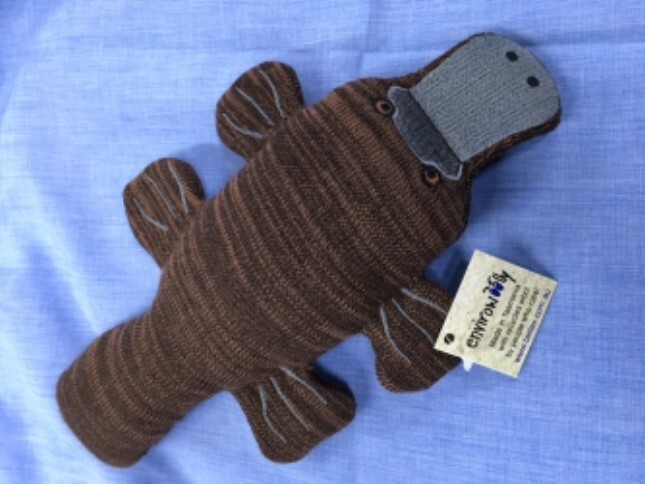 We have also introduced a new Platypus Envirowoolly to our range which is already proving to be extremely popular. We continue to provide interesting and varied training options for our Supported Employees, which include traineeships as well as in house training. An increased number of our Supported Employees are now directly involved with the cutting, sewing and finishing process of our school jumpers. This is an achievement of which we are all extremely proud! Our highly skilled Tastex Support Team continue to provide professional support for our Supported Employees while striving for excellence in all areas of production. Tastex is not only a diverse and interesting workplace, but also extremely rewarding. I would especially like to thank our loyal customers. It is your continuing support which enables us to achieve our goals! 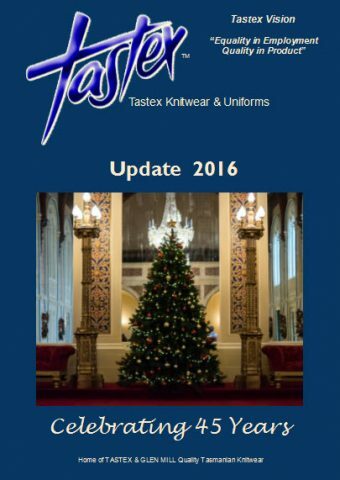 The official annual newsletter of Tastex Knitwear & Uniforms. 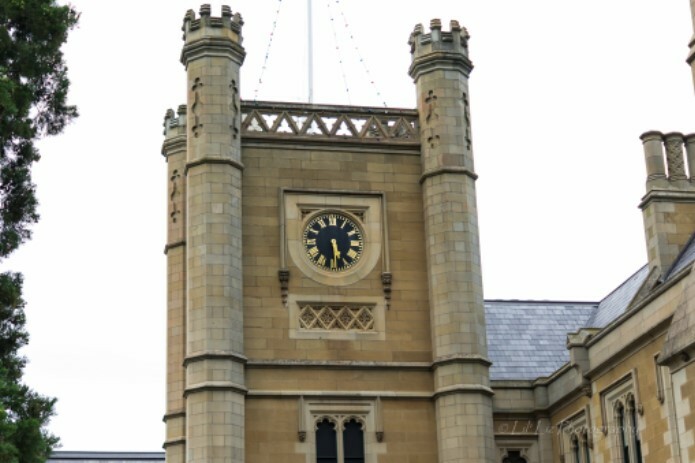 The historic clock tower at Government House. In December, Tastex celebrated it’s 45th Anniversary as a “Special Work” of the St Vincent de Paul Society. The Tasmanian Governor Her Excellency Kate Warner, invited us all to mark the occasion with a cocktail reception at Government House. A magnificent Christmas Tree graced the Government House Ballroom. 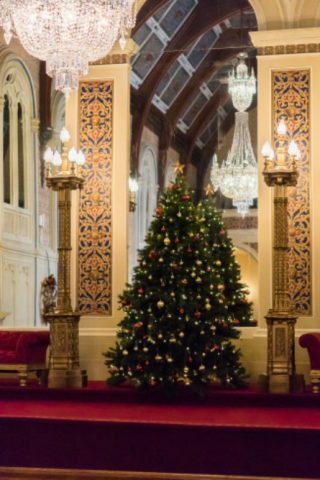 We were fortunate to be invited during the festive season as Government house had been spectacularly decorated for Christmas! Employees, Tastex Committee Members, and Members of the St Vincent de Paul society were treated to a wonderful reception and also enjoyed a tour of the house and gardens. Following the Government House reception, we continued our celebration with a formal dinner at The Old Wool Store. Alex Jackson with Dr Elena Kornaczewski. Local radio personality Alex Jackson kindly agreed to be our M.C. for the evening. Alex has been a loyal supporter of Tastex for many years. His professionalism and willingness to assist Tastex was, as always, greatly appreciated! St Vincent de Paul State President, Mrs Toni Muir, attended the dinner along with St Vincent de Paul Society members and staff. 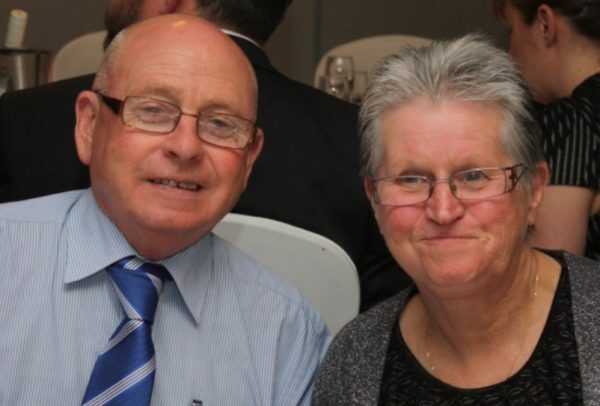 St Vincent de Paul State President Mrs Toni Muir & Mr Tony Muir. Tastex Employees were presented with awards for their many achievements throughout the years. Certificates for long service were awarded to a number staff, one for over 30 years service. Committee of Management Chairman Maurie Harris presents Luke Foley with his award for Outstanding Achievement. One of Tastex’s Supported Employees, Luke Foley, filmed an informative video which showcased the production processes during a typical working day at Tastex. Luke’s video was enjoyed immensely by all those attending the dinner. Luke was presented with an award for his outstanding achievement. A number of our loyal customers were invited to help us celebrate our special day. Scott Cordwell & Penny Cook from Cordwell Lane Builders (left) with Mel Bush & Mal O’Brien from The Cascade Hotel. It was heartwarming to see them enjoying the evening, joining with staff to appreciate the festivities. Our celebration concluded with some enthusiastic moves on the dance floor. The evening was a great success and a wonderful celebration of our journey throughout the last 45 years. The Tastex Team has been extremely busy keeping up with orders for our “Envirowoollys” while also completing embroidered garments for our school and corporate customers. Until recently we owned one single head embroidery machine and one four head machine. Our embroidery area provides Tastex Supported Employees with a wide range of work activities which enhance skills and promote learning opportunities. We needed to increase our embroidery capacity by purchasing a third machine with six heads. As Tastex is a Not-For-Profit organisation with limited resources, it is financially challenging to upgrade large items of machinery which are extremely expensive. 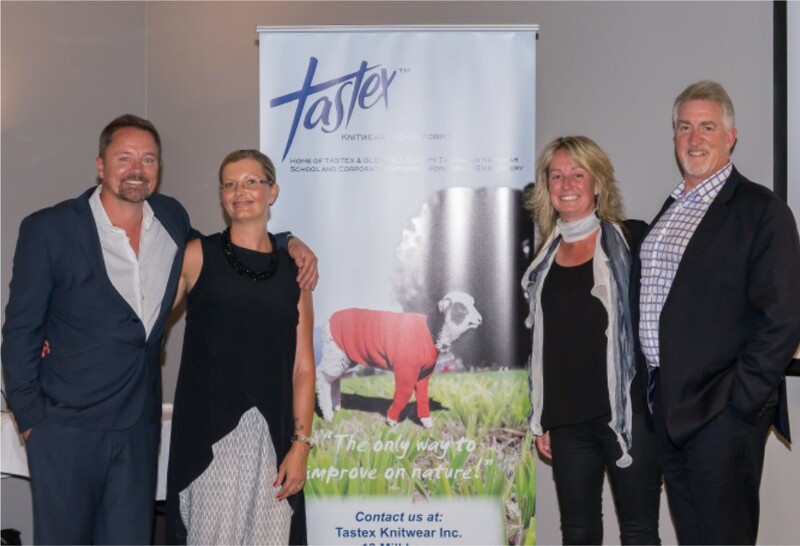 Tastex applied to The Tasmanian Community Fund for assistance. The T.C.F. were established to provide grants to Not-For-Profit organisations. 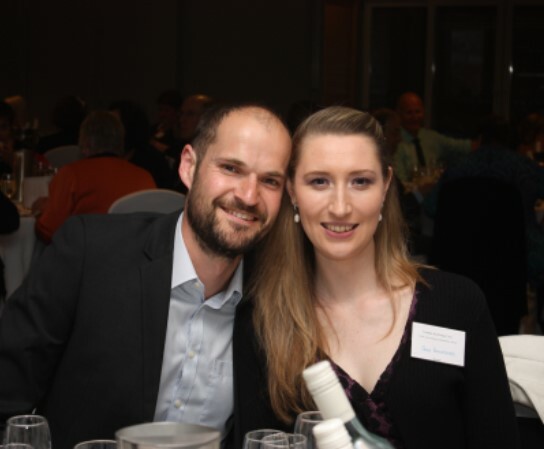 They provide grants to community organisations to make a difference by improving the social, environmental and economic well-being of the Tasmanian Community. Tastex was very fortunate to have our application for funding approved! We were then able to order our much needed 6 head embroidery machine from Germany. When our new machine arrived in December, we converted our lunch room to accommodate the embroidery equipment as the room currently being used was too small. We needed to install air-conditioning, but once again finance became an issue! 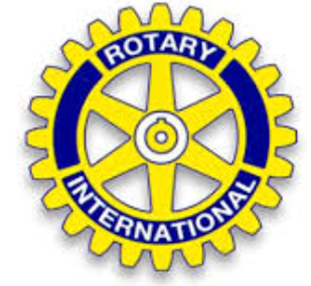 A big thank you to The Rotary Club of Glenorchy who very kindly offered to fund the air-con, making our new embroidery area a pleasant space to work in. 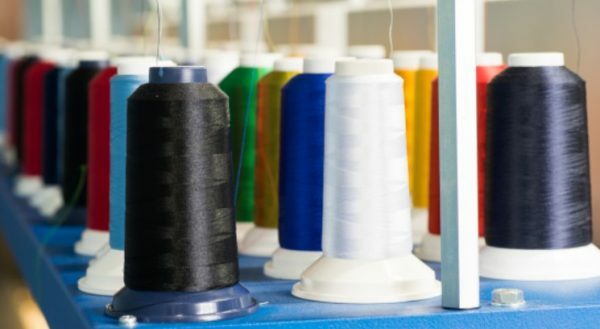 With our additional 6 embroidery heads, we can now speed up the production of our “Envirowoollys” and also keep up with our customer’s embroidery needs. The new machine has the capacity to embroider up to 12 colours on each design, allowing us to be both versatile and innovative whilst providing ongoing employment and training for our Supported Employees. Our new six head embroidery machine embroidering facial features on our Tasmanian Tiger Envirowoollys. Annette Young. Seamstress and Support Worker at Tastex. 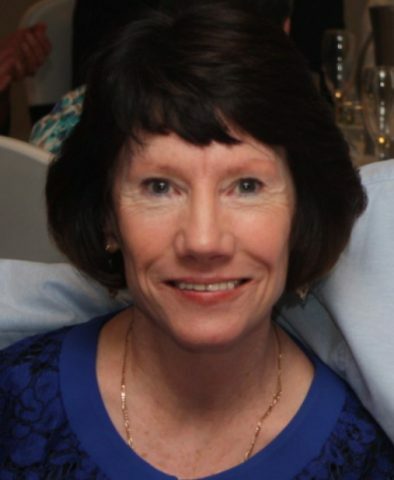 Annette Young joined the Tastex Team in 2013. Annette provides support for our supported staff in the sewing area who have special needs. She has recently completed her certificate 4 in Disability Care. Annette is also a skilled seamstress who shows great attention to detail. This is extremely important when working within the framework of our ISO Quality Assurance. Annette is often called upon to measure clients who require their knitwear to be tailor made. This requires a high level of accuracy as the panels are then knitted to size. Annette cuts and sews the knitted panels, producing made to measure garments. Customers take home a knitted garment which is custom made for them. 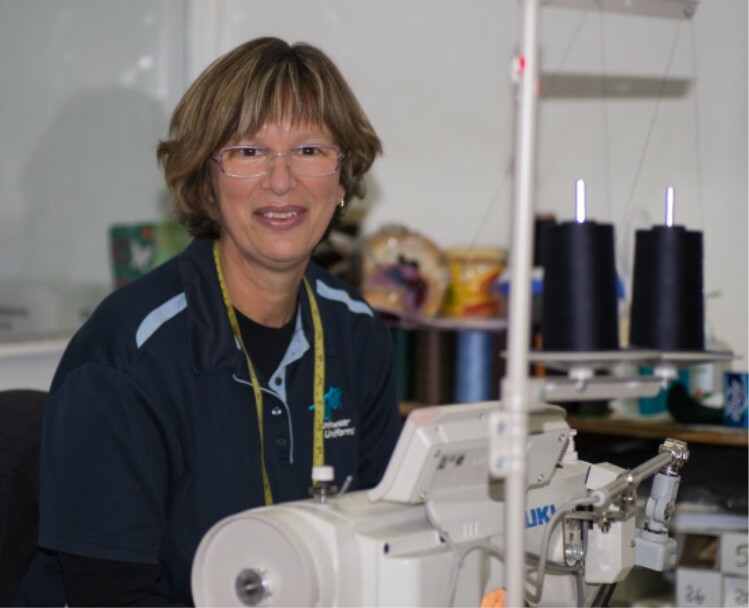 Annette is a vital member of our sewing team. She produces between 20-30 finished garments each day, including school jumpers, cardigans, vests and rugby jumpers. Annette also makes knitwear for corporate clients who purchase their knitwear from Tastex because it is not only Australian-Made but premium quality. Between making knitwear and supervising supported employees, Annette’s day is jam packed. Whenever she has a spare minute, Annette helps with the production of our Envirowoolly’s. Sewing around Devils, Wombats, Platypus, Tigers and Koalas in preparation for stuffing by our supported employees. Working as part of the Tastex Team, Annette has proved to be both skilled and versatile. Her enthusiastic contribution is welcomed and appreciated! Comfy to wear and easy to care for. Your Glen Mill Softwear school knitwear is not only comfortable, but tough and durable. To maintain the smart look of your quality knitwear, follow the washing instructions on the back of the label. Firstly, it is important to separate dark and light colours. Simply turn the garment inside out and place in the washing machine. Use a Wool mark approved detergent as these do not contain bleach. Set the machine to Wool Cycle and warm machine wash. Warm rinse and normal Spin. Glen Mill Softwear garments can also be tumble dried. Use the dryer on the low heat setting. Following the washing instructions will ensure that your Glen Mill Softwear knitwear will stand up to the test of time, giving you and your family great value for money. Our “Softwear” range is available in a variety of styles. We can also design and manufacture to your specifications. Our range includes Jumpers, Cardigans, Vests, Rugby Tops, Scarves and Beanies. Tastex delivers direct to your school with no added freight costs. We offer a 5% discount for all indent orders which allow 12 weeks for delivery! 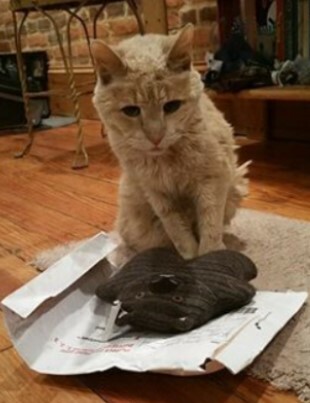 Tigger is a 21 year old cat who was abandoned by his owner in Baltimore U.S. Shortly after being adopted by his new parents, it was discovered he was in kidney failure and had a tumor...so his new parents started him a Facebook page with a bucket list! Tigger has over 1.7 million likes on his Facebook page, and is a regular feature on the Tastex Facebook page. If you would like to see Tigger and follow his story, take a look at Tigger’s Story, "The 21 year old cat and his bucket list!" Tigger sleeps with his Envirowoolly Wombat. A Tastex customer who had purchased some of our Envirowoollys, sent Tigger one of our Wombats all the way to Baltimore. 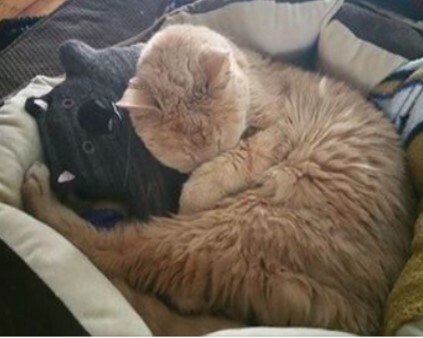 Tigger loves his Wombat, sleeping with him, enjoying his soft cuddle companion. The most important part of Tigger’s story shows how amazing it can be to adopt a geriatric pet and give him the best, for his remaining days! Tastex is honored to have played a small part in Tigger’s story by making Wombat. We hope Tigger can tick off all the wishes on his bucket list! Our Envirowoolly Family is proving to be very popular. 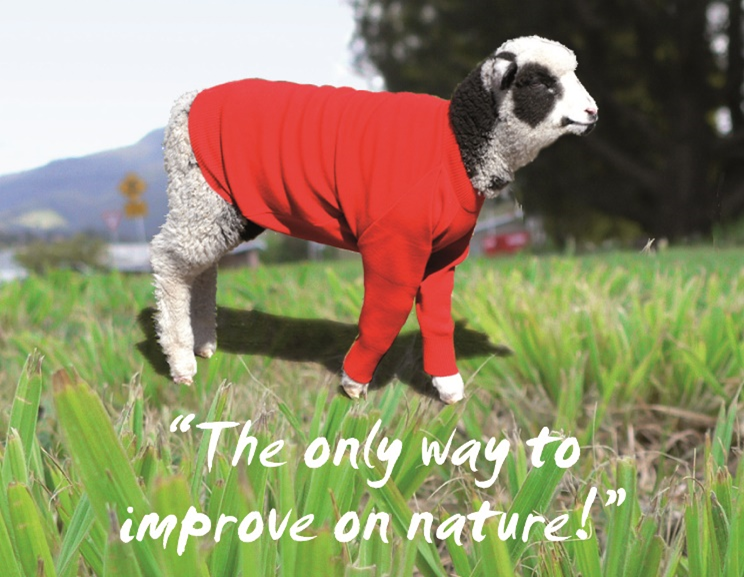 During the past 12 months, sales of Envirowoolly’s have increased dramatically. Envirowoolly Platypus. The latest addition to our Envirowoolly range. The Tastex Team decided that it was time for Tassie Devil, Wombat, Tassie Tiger, Koala and Sheep to welcome an addition to the family. We would like to introduce Platypus. He was only released during August and is already causing a splash! Tastex Envirowoolly’s are made from wool, their features are embroidered and they are filled with woolen offcuts which would otherwise be discarded. 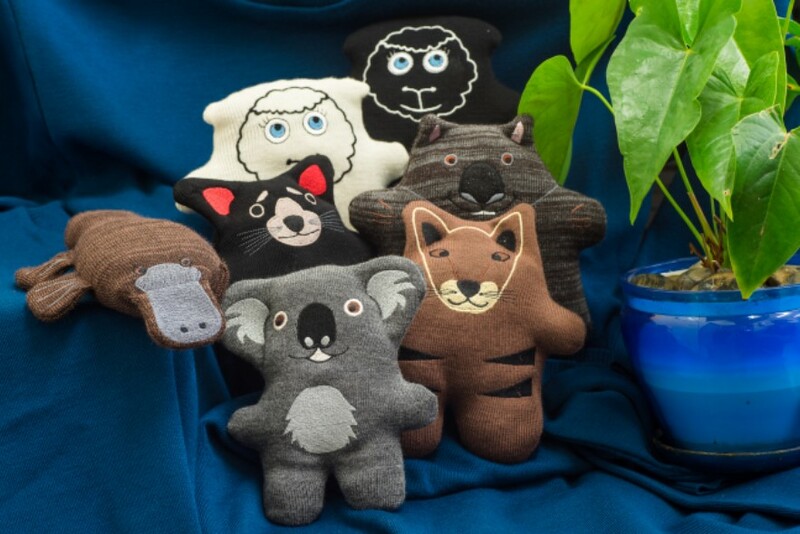 Envirowoolly’s make a great gift for visitors wishing to take home a Tasmanian made product. They are also environmentally friendly and completely safe to give to young children. Envirowoolly. 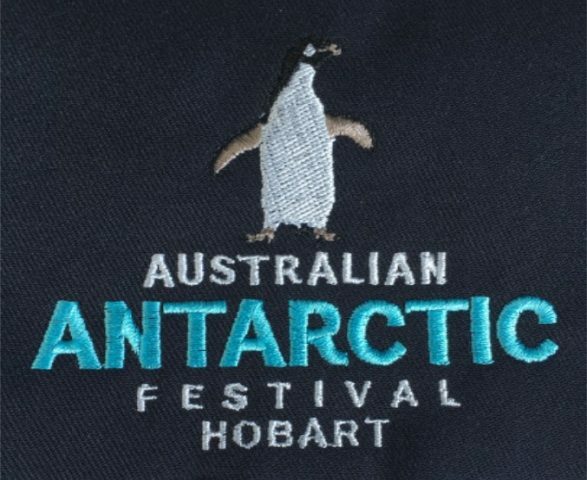 Made in Tasmania by people who care. 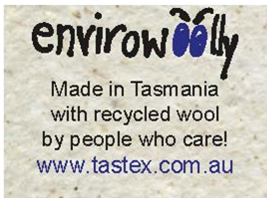 Producing Envirowoolly’s enables Tastex Supported Employees to learn additional skills. Wool offcuts need to be pulled apart to create the stuffing which is then used to fill each Envirowoolly. This results in a hand made product of which we are all extremely proud! 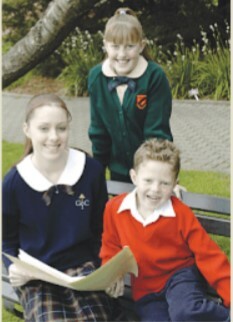 Tastex manufactures “Glen Mill” “Softwear” school knitwear which we market throughout Tasmania and mainland Australia. 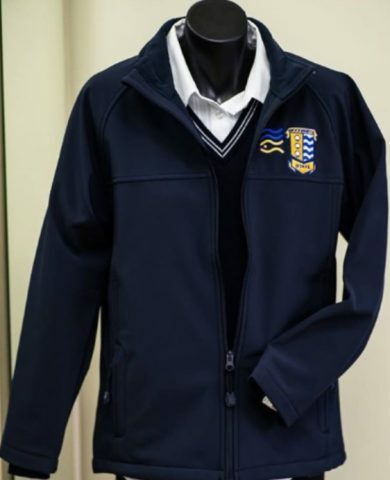 Our “Glen Mill” school knitwear range which includes Jumpers, Vests, Cardigans and Rugby Jumpers is renowned for it’s softness and durability. Our school knitwear has withstood the test of time, with schools purchasing their knitwear requirements from Tastex since 1970. Tastex has expanded it’s range of uniform items to include not just Knitwear, but Jackets, Polos, Caps and Sportswear. Many of our customers now purchase these items from Tastex along side their knitwear. 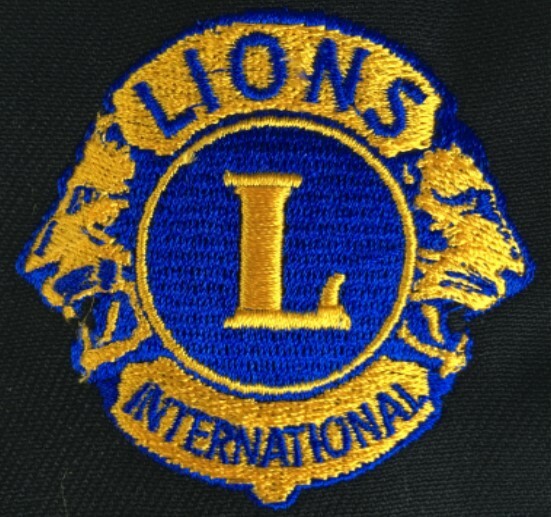 Our high quality embroidery service can embroider logos on items prior to dispatch. It makes sense for customers to order as many items as possible from Tastex, especially as we manufacture the knitwear onsite ensuring the highest quality at the most competitive prices. Our professional staff handle your order with a minimum of fuss. We ensure that our customers receive prompt, friendly service with their orders delivered on time! We offer a 5% discount for indent orders of knitwear which allow 12 weeks for delivery. This is a great incentive for customers to place their orders early. 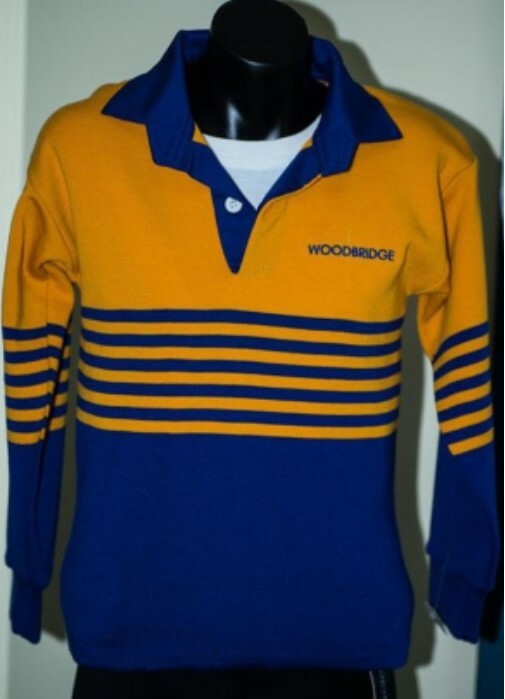 A Soft Shell Jacket, with Woodbridge Primary School logo together with our Glen Mill Knitted Jumper. A number of Sporting Clubs are now ordering from Tastex. We can provide track pants and jackets, hoodies, polos. Tees, singlets, caps and bags. Water Polo teams, Soccer clubs, Basketball clubs, sailing clubs, school sports teams and local festivals are all ordering their gear from us. 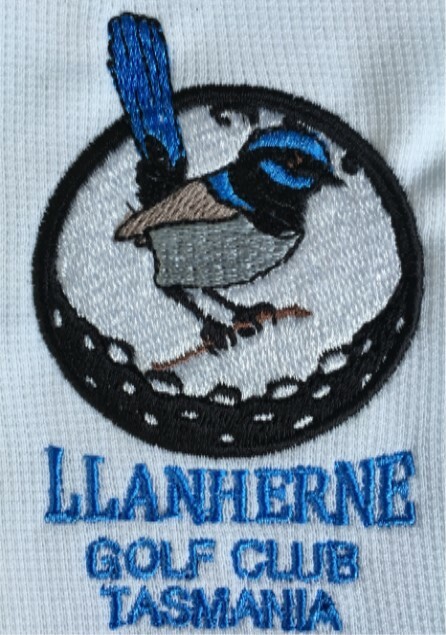 We embroider sponsor logos as well as club logos onto garments. We know how important it is to meet club deadlines and always deliver on time. We also supply Corporate Uniform & Workwear to a growing number of businesses. Garments range from aprons to suiting. If we don’t stock an item, we will order it in. Our customer’s needs are our priority. Business entities need to grow and develop their corporate image. Often changing or enhancing their logo to reflect the message they are sending to clients. Tastex can assist with this process by digitising new logos which we can then embroider on to garments, or by making changes to existing logos. The best result is an image which projects an individual identity that is easily identified by customers. Tastex embroidered logo for Lions International. The Cascade Hotel, Hobart, since 1846. Talk to us for all your uniform, digitising and embroidery needs. Our skilled Team can help you to create the style that you are looking for.